Sometimes, you just want to make a simple but pretty top to add to your closet, something that works in prints or solids, knits or wovens... so try this! This supercute top is designed for lightweight woven fabrics like voile, lawn or rayon challis, but it’s also gorgeous in lightweight drape-y knits like rayon, modal or bamboo. 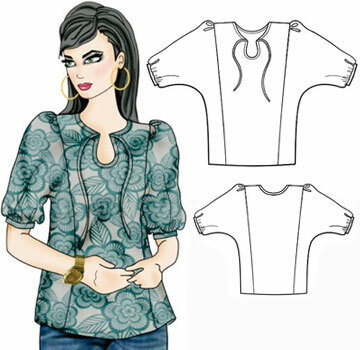 Pull-over, semi-fitted Peasant Top has shoulder-princess seams and side panels with cut-on dolman sleeves, gently gathered at the shoulder. Top features above-elbow-length sleeves gathered into self-bound cuffs, and a bound key-hole shaped front neckline with self-fabric ties. The top finishes at the mid hip. Wear this super-pretty top tucked into a matching or toning tiered skirt for a romantic weekend or vacation outfit, or try it to add a feminine touch to your favorite jeans, or to soften a tailored blazer.